Why Should You Clean After Renovations? That new home upgrade can help your property retain its appeal for several years, but in the days immediately after the renovation work has been completed, you may have to clean the area thoroughly. While the post-renovation cleanup work is not a process you will look forward to as the homeowner, it’s important if you wish to achieve maximum benefit from the renovation work. Here we’ll look at why it’s important to clean your home after renovation work. After a large scale renovation project, it’s not uncommon to discover open paint cans, wood shavings and other elements left in the construction space. These products can have a toxic impact within the home if they’re not removed within a quick timeframe after the renovations. For example, dust from the renovation work could contain harmful chemicals. This dust could be found across home walls and other surfaces. Professional post-renovation cleaning work can help ensure these elements are safely removed from the home so the property can be enjoyed by the entire family. Home cleaning can help you identify potential issues within the renovation work. Oftentimes, professional cleaners can uncover scratches in surfaces and remove dust that reveals unprofessional construction underneath. These types of issues are often only discovered once a complete and comprehensive cleaning job has been completed on the property. It’s a process that could help the homeowner recover the value of their renovation service investment. Often, the reason that homeowners decide to complete a comprehensive renovation on their property is to show the home to potential buyers in the near future. Professional cleaning work can add polish to this process and ensure the home looks its peak best during open house events. Before the sale has been completed, you can also use the renovated space to host social events within the property. Post-renovation cleaning work can help maximize the true value of any renovation and ensure that both guests and potential buyers enjoy their time within the renovated area. By cleaning your home in the days immediately after renovation work has been completed, you can maximize the value of the upgrade and protect those inside against potentially hazardous renovation materials. 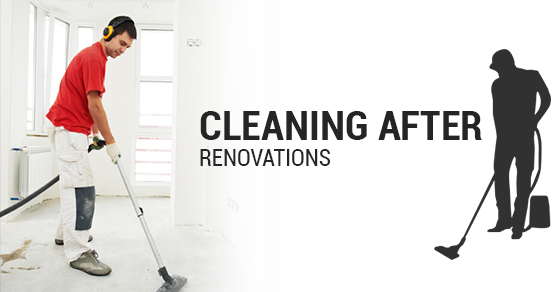 Speak with one of our trusted experts directly to learn more on the renovation cleanup process.